Stop the bleeding: Try to stop any bleeding with a clean washcloth or sterile piece of gauze. As you do this, check for broken teeth and/or missing teeth. If there are missing teeth, try to locate them, and place them into a cup of milk, or if that is not available, use a cup of cold water. 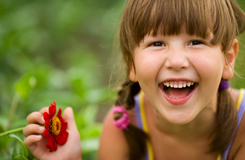 Call East Cobb Dentistry for Kids dental office. We offer same day service appointments for dental emergencies – for patients and non-patients – within our normal operating hours. Do not move the jaw. Stabilize the jaw by tying a towel, necktie, etc., over the top of the head. Apply cold compresses. Go to an oral surgeon or hospital emergency room immediately. Clean the area around the tooth. Rinse the mouth with warm salt water and use dental floss to remove any trapped food between the teeth. DO NOT place aspirin on the gums or tooth. This will cause a burn to the gum tissues. If there is swelling, apply cold to the outside of the face. Take acetaminophen or ibuprofen for pain. Call the dentist.